Event rescheduled to Tues. Feb 5. 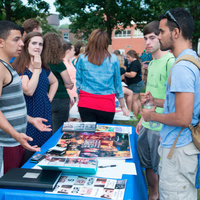 Did you know Fredonia has over 170 recognized clubs and organizations on campus? They will all be set up in the Steele Hall Fieldhouse. It's your chance to learn about all the academic, athletic, music, and social clubs on campus and find something you'd enjoy. It is hosted by Spectrum Entertainment Board and sponsored by The Student Association. Students who cannot attend Activities Night can still get involved! Please visit Blue News for more information on the clubs we have on campus.